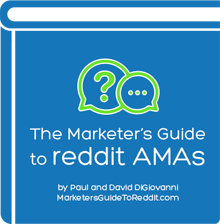 I took some time, this weekend, to read The Marketer’s Guide to reddit AMAs by Paul and David DiGiovanni of GroupSRC. It’s a free guide, 30 pages in length, available if you subscribe to their newsletter. Paul and David are focused on helping marketer’s use reddit in a way that is authentic and respectful to the community. If it’s for marketers, why am I writing about it here? Because it’s really a guide to hosting an AMA, and AMAs, when done right, are definitely a form of community building. David has written a couple of guest posts here. If I had a question about reddit, I’d ask them. And that’s why I read the guide. It’s great. In a half hour or so, you’ll have consumed a wonderful primer on how to hold an AMA on reddit. It’ll stop you from making preventable mistakes. Even if you think you know how to respectfully approach a community like reddit, you’ll pick up nuggets that will take you from good to great. For that reason, I definitely recommend the guide (download here) to anyone looking to host an AMA, or just looking to pick up a bit of information on approaching reddit. They have also released more guides targeted at podcasters, artists and beginners to reddit. I’m sure they are just as valuable.